The signer personally appears before the Notary and either signs the document that is to be notarized in the presence of the Notary or acknowledges that he or she signed the document prior. The signer personally appears before the Notary and signs the document in the presence of the Notary in addition to being administered an oath or affirmation confirming the truthfulness and accuracy of the document. The affiant personally appears before the Notary and swears or affirms that the information contained in the Affidavit is true and accurate prior to signing the document in the presence of the notary. The notary examines the original document and certifies that the copy is an exact and true replica of the original. Notaries in Virginia may not certify copies of birth, death or marriage certificates nor are notaries allowed to certify documents issue by a court. The notary acts as an Authorized Representative for a prospective employer. The notary does not function in the capacity of a notary when doing this. He or she reviews the prospective employees identification documents and signs as an Authorized Representative. Note: No notarial acts are required by form I-9. 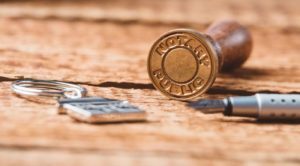 Therefore, the notary will not affix his or her seal to the document. If you are allowed to call-in to a Court hearing, the notary sits with you and verifies your identity when prompted by the Court. Our National Notary Certified Signing Agent will travel to the home or office of your client and execute their loan documents at a time that is convenient for him or her. This service includes: travel to the borrower, execution of the documents and return of the documents to the lender or lender’s agent. We look forward to meeting all your notarial needs!